On 5 November 2015, two mining dams operated by Samarco Mineração SA, a joint venture of Vale and BHP Billiton, collapsed in Brazil releasing 50 million cubic meters of toxic iron-ore residue. The residue destroyed the nearby district of Bento Rodrigues killing 19 and polluting the water supply of hundreds of thousands of residents. Two weeks later, Samarco signed a $262 million agreement with the Brazilian Government to fund mitigation and remedial measures for the environmental disaster. On 2 March 2016, Samarco reached a heavily criticized $6 billion settlement to restore the severely damaged environment and indemnify the affected communities. Andrew Mackenzie, CEO Of BHP Billiton stated, “This agreement is an important step in supporting the long-term recovery of the affected communities and the environment.” However, Brazilian prosecutors insisted the deal did not guarantee proper cleanup and damages because the affected populations were not included in settlement talks. On 3 May 2016, the prosecutors filed a $44 billion civil lawsuit in Brazil for cleanup and restoration costs. On 16 March 2017, a judge suspended the lawsuit to facilitate the negotiations of a settlement between the government and the companies. The partial agreement also calls for groups of experts to carry out environmental and social impact studies, and evaluate recovery programs. On 25 June 2018, Vale and BHP Billiton announced they signed a deal with Brazilian authorities that settles a USD 5.3 billion lawsuit related to the 2015 dam collapse. The agreement also sets a two-year timeline to reach a settlement in a separate lawsuit filed in May 2016 which will be put on hold while the parties negotiate. On 2 October 2018, Brazilian prosecutors announced that they reached a final compensation deal with Samarco, Vale and BHP Billiton, which includes compensation payments for relatives of the 19 people killed in the disaster and to those who lost their properties. The amount has not been disclosed. 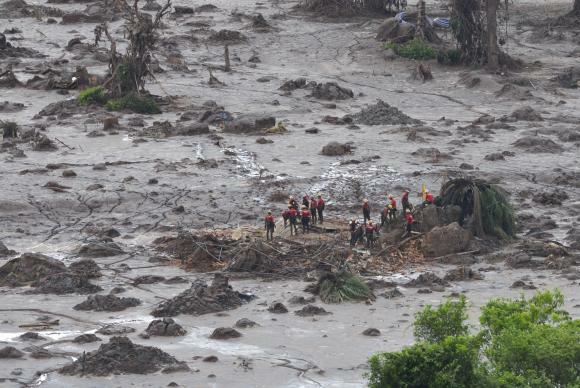 On 20 October 2016, Brazilian federal prosecutors filed homicide charges against 21 people, including top executives of BHP Billiton, Vale and Samarco, for the 19 deaths resulting from the dam collapse. In July 2017, the federal court suspended the criminal case. Samarco's lawyers claim illicit evidence was used to build the case against the company's executives. In May 2018, shareholders filed a lawsuit against BHP Billiton in Australia, alleging that the company misled them as it was aware of the safety risks prior to the disaster, but failed to take any action to prevent it. In August 2018, the company settled a similar lawsuit filed by US shareholders, agreeing to a $67 mln. compensation without admitting liability. In December 2018, an Australian judge allowed the Phi Finney McDonald shareholder class action to proceed, and stayed rival lawsuits from Maurice Blackburn and Johnson Winter & Slattery. In November 2018, more than 240,000 plaintiffs, including Brazilian municipalities and Krenak indigenous communities, filed a lawsuit at the UK High Court in Liverpool against BHP Billiton. The lawsuit seeks compensation for damages caused by the dam collapse. Phi Finney McDonald has won the right to pursue a shareholder class action against BHP related to the Samarco dam catastrophe, beating two other law firms vying for the case. Federal Court judge Mark Moshinsky...ruled the case could go ahead and stayed rival proceedings from Maurice Blackburn and Johnson Winter & Slattery. The class action revolves around the 20 per cent fall in BHP shares that followed the 2015 disaster, when a dam wall collapsed at its Samarco joint venture in Brazil, killing 19 people and causing widespread environmental damage. Justice Moshinsky preferred the funding model of Phi Finney McDonald, which details 18 per cent of any winnings would go to US-based backer G&E KTMC Funding. This compared to a 15 per cent take from the self-funded Maurice Blackburn model and a complex sliding scale allowing up to 21.5 per cent to the funders of the JWS claim. Vale understands that the deal mentioned above is the agreement signed in October with the State Prosecution Office of Mina Gerais, which terminated the main lawsuit related to the dam collapse in Mariana and enabled the retake of the Mediated Indemnification Program (PIM) for the community affected in that region, based on the damage matrix used by the Renova Foundation along the River Doce watershed. Henceforth, the Renova Foundation may present compensation proposals to those affected by the dam collapse and discuss their legitimacy and amounts due to each one. Regarding to the lawsuit filed against BHP Billiton before the UK High Court in Liverpool, Vale clarifies that the company is not a defendant in the suit.